Spring Street Dermatology is a comprehensive medical and cosmetic treatment center. 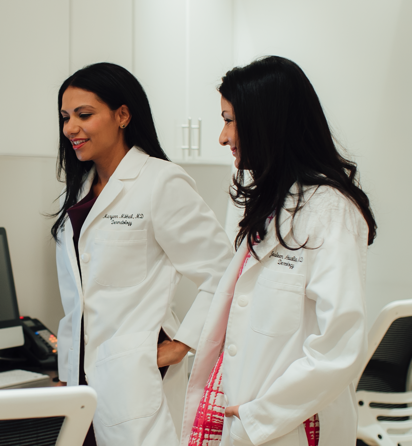 With highly trained, caring practitioners and cutting edge technology, we offer a well-rounded practice that can address all of your skin care needs. Whether you are due for an annual skin cancer screening or are suffering from a skin condition, at Spring Street you will find experts who will thoroughly examine you, explain your options and work with you to formulate a treatment plan. We treat all dermatologic diseases, but find clearing acne to be most rewarding. Our approach is integrative with a special focus on determining the underlying cause of breakouts. From there, we establish a skin care regimen and design an individualized, results driven treatment plan. For chronic skin conditions such as psoriasis, vitiligo, eczema and lichen planus, we offer narrowband UVB and targeted excimer phototherapy seven days a week. Our aesthetic philosophy is to achieve natural results using the simplest, least invasive techniques possible. Devices and procedures available at Spring Street include: laser resurfacing (ablative and non-ablative), laser hair removal for all skin types, pulsed dye laser (PDL), intense pulsed light (IPL), Miradry, Blu U photodynamic therapy (PDT), microneedling with PRP, chemical peels, Botox, Dysport, Restylane, Juvederm and Kybella. Want to learn more? Contact us now or make an appointment.